Oh...Autumn. I love this time of year! Cool, brisk temperatures just beg for warming cinnamon spice and pumpkins, don't they? It's also the time of year I start getting a little stressed out about the upcoming holidays. Deciding what to give my friends and family every year is one of my biggest procrastinations. Luckily, I have discovered that making handmade soaps to gift for the holidays is always appreciated by my family and friends! If you have ever wanted to try making hot process soap, you'll love this Fall Mandarin-Spice Soap recipe! My Mandarin-Spice hot process soap recipe is warm and comforting with the calming and uplifting properties of Mandarin Orange Essential Oil and Cinnamon. It smells delicious, and the aromatherapy benefits will make you so happy! FTC Disclosure: This article has affiliate links scattered throughout. If you click through and make any kind of purchase, I may earn a very small commission at no extra cost to you! (plus a bit of Nutmeg EO if you like!) ***I get my essential oils and some supplies from Starwest Botanicals because I can buy in bulk. The links above are for Amazon for your convenience. 2 tablespoons of ground Cinnamon (for exfoliation and a little extra color texture) I get my powders and spices from Starwest Botanicals. 1) A crockpot dedicated to soap making. Some people have their crockpots do double duty between food and soap. I'm just not comfortable with that, so I have two dedicated soap crock pots. I use the large ones (this is a 3 pound recipe, so you will definitely need a large crock pot. 2) An immersion blender to bring the oil and lye solution to trace. This is important. If you don't have an immersion blender, you will probably be stirring for hours instead of just 5-10 minutes, max. 6) Kitchen Scale---This is a MUST have when making soap. Your measurements must be accurate to within a hundredth of an ounce for best results. Since you are working with lye, it's best not to be off. Learn how to make hot process soap and customize it the way YOU want with confidence! You'll love my new eBook! It's also available on Amazon Kindle! Keep in mind that making soap using lye (sodium hydroxide) is potentially very dangerous! Be sure to wear gloves and eye protection because lye is extremely caustic and can burn! Please read the article linked above and do some extra research if you are new to soap making. This website is excellent for more information: TheNerdyFarmWife.com and OakHillHomestead.com both have excellent soap information. Get your lye solution going. Measure out your water into a pyrex glass measuring container. I use one that is completely dedicated to making soap. Then pour your lye slowly into the water and mix well. I do this outside because making the solution creates fumes that can be dangerous. PLEASE BE SURE TO WEAR YOUR GLOVES AND EYE PROTECTION! I also wear long sleeves. NOTE: It is VERY important to pour the lye into the water and not the other way around. If you pour water on top of the lye, you may end up with a caustic volcano. Also, the solution will be quite hot at first! Since you are making hot process soap in this tutorial, though, you don't need to worry about it being a certain temperature before using it. Just be aware that it is HOT. Now get your oils into the crock pot. Use the LOW setting. During the winter time the coconut oil and the shea butter will be solid, so you'll need some time to have them melt down. Once the oils are melted together, go ahead and add your colorant---in this case, 2 tablespoons of Safflower Powder or Paprika if you want a more orange soap. Annatto powder will work fine, too, but go easy on that because it can get VERY orange fast. Another option for color is Turmeric powder, if you'd like a more golden soap. Once your oils are melted and you have added your herbal powder for color, gently pour the lye solution into the oil. Using your immersion blender (BE SURE YOU HAVE YOUR GLOVES AND EYE GEAR ON! ), to mix, mix, mix all together until it comes to trace. This simply means it looks like pudding with a gentle peak. It's better to be a little too firm than too soft, if you are in doubt. You'll see the soap going through some different stages, until it reaches a rather translucent waxy stage, kind of like vaseline. There should be NO opacity in the mixture---it should be translucent. Once you get to this point, you can give it the ZAP test. Taking some off your wooden spoon, roll it around between two fingers. It should feel like warm wax. Once it is cool enough, touch this to the tip of your tongue. If you feel a zap, it's not ready yet! Personally, I like to over cook it a bit to be sure I don't get zapped. I had a batch once, where I forgot to put in the almond oil, and I couldn't figure out why it wasn't completely saponifying (turning into soap). I kept getting zapped! Trust me, it's NOT enjoyable. You'll definitely know if it's not ready or if you did something wrong. Turn off the crock pot, and let it sit for about 5 to 15 minutes with the lid off before pouring in your essential oils. Then stir, stir, stir them COMPLETELY into the batch. If you are sensitive to strong smells, you might want to wear a mask for this part as you stir in the essential oils because the fumes can be STRONG as the essential oils get incorporated into the soap. After this, go ahead and pour a couple of tablespoons or so of the Cinnamon in and just stir it around a bit. I like chunks of dark color, so I don't go too crazy trying to mix it in super well. That's up to you, though! Pour the mixture into your soap mold. Actually, you'll be using a wooden spoon to glop it in. Then press it in well with your spoon. I'll use my hands on the top to press even further. You don't want air pockets, and you want the soap to completely fill in the corners of the mold. You can also gently drop your mold on the counter a few times to get the soap into the corners and any air pockets out. Jan Berry has incredible soap making tutorial tools! Check out her eBook selections! After your soap is completely cooled down, take it out of the mold and let it sit overnight or for a few more hours. You can cut it as you need it, and this will actually help it stay fresh and smelling great longer too! OR, if you want to, go ahead and cut it into bars. I usually let my hot process soap cure for a day or two before using it. It just helps with further evaporation in case it's a bit moist. But, since this is hot process soap, it's just fine to use right away! That's one reason I love hot process soap making. I love the scents of Fall! Warm, spicy baking scents....Mmmmm... And this handmade soap recipe gives you ALL of that! The Mandarin essential oil adds just a tiny bit of citrus/Oriental scent to the soap, while the Cinnamon/Clove/Nutmeg adds the spice. The Patchouli essential oil grounds the citrus and rounds out the scents. It's delicious! Plus, if I can just make enough soap, I'll have some awesome gifts my friends and family will love! I hope you enjoy this recipe! :-) Do you make your own soaps? It's a wonderful experience, and I know a few folks who are now addicted! Remember to take a look at my other soap tutorials, if you are newer to making hot process soap! NOTE: You can pick up my free Soap Making Checklist (which is a life-saver for helping you not forget any steps) at the end of the article! 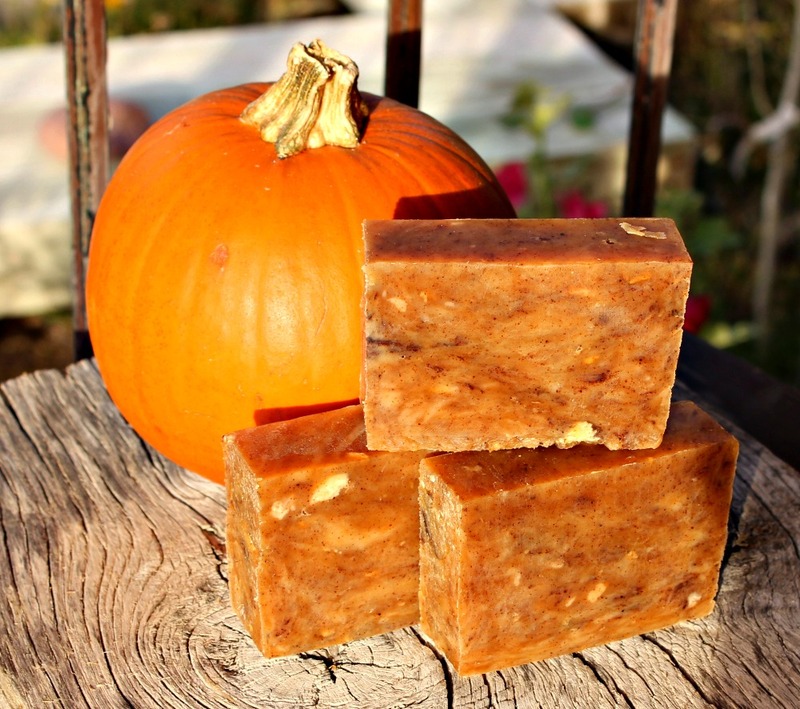 Pumpkin Pie Spice Fall Soap--SO Good for Your Skin! Cold Process vs. Hot Process Soap: Which is Better? Peaceful Warrior: A Cinnamon Vanilla Pink Clay Soap Recipe---Just Delicious! P.S. Don't forget to sign up for the Newsletter! When you do, you'll get access to the free Resource Library, which contains eBooks, guides, and lots more. It’s updated weekly! You can get the Soap Making Checklist there too!